More than a decade before Oklahoma entered the Union as America’s 46th state in 1907, Jewish businessmen were already opening stores in towns popping up across the territory. The neighboring towns of McAlester, Hartshorne, and Wilburton, located across Pittsburg and Latimer Counties in southeastern Oklahoma, were no different. None of these towns was able to sustain a Jewish community of its own, so they joined forces, coming together for services as early as 1901. By 1910, when the community’s first nationally-affiliated Jewish organization was founded, there were more than ten Jewish-owned businesses in the three towns. By 1915, the number of Jewish families in the two-county area had grown large enough that a congregation and a few Sunday school classes were sustainable. Grand Leader Store in Hartshorne. As early as 1895, at least two Jewish-owned stores had opened in Hartshorne and McAlester. The New York Store in Hartshorne was owned by Sam Wolfman and later by his wife and her brother, Jacob Epstein. Abbie Wolf lived with his three sisters in 1900 and owned the Globe Department Store in McAlester by 1895. By 1896, Al Mayer had opened The Grand Leader in Hartshorne, and within ten years ownership had transferred to Sam Oppenheim. A store of the same name, owned by Harry Serwinsky and Mike Goldberg, opened in Hartshorne around 1900, and would remain open until Mike’s son Benny retired in the early 1970s. John Joseph came to Wilburton in 1897 and a year later opened his own store, which remained a family business until its closure in 1978. In 2012, the “Joseph’s” stone name plaque was still visible on the building of the store’s former location on East Main Street. B'nai Israel Religious School, c. 1920. By 1901, Jewish families had enough of a presence in the area to organize themselves for services, at least on Rosh Hashanah. A notice in the South McAlester Capital of that year announced that the “Jews of Alderson and Krebs,” both within six miles of McAlester, would be celebrating both days of Rosh Hashanah, a practice common for more traditional Jews. For many of the early years, services were held on the second floor of the Grand Leader building in Hartshorne, and Jews gathering there from surrounding towns were hosted by families living in Hartshorne. In 1905, a small notice announced the closure of the Golden Eagle Store in McAlester, “on account of Holiday”—the store closed for two days. Only one day of Rosh Hashanah was “observed by McAlester Hebrews” in 1907. Between then and 1915, Jewish-owned stores occasionally announced one-day closures in observance of Rosh Hashanah. Led by Harry Byers from nearby Atoka, the holidays continued to be observed without interruption until World War I. The first formal organization of a Jewish community in the area came around 1910, when the McAlester chapter of B’nai B’rith was formed. The Jewish community’s activities picked up momentum in 1915 when Rabbi Charles Latz of Fort Smith, Arkansas, visited both Hartshorne and Wilburton. Rabbi Latz’s interest in the Jewish communities of Pittsburg and Latimer Counties was instrumental in this period, and led to the formal organization of Sunday school, confirmation classes, and the establishment of a congregation. Rabbi Latz organized Sunday school classes in both Hartshorne and Wilburton and met with them in monthly joint sessions, in addition to holding services in both towns on alternating months. In 1916, Congregation B’nai Israel was formed in Hartshorne. According to the 1919 American Jewish Year Book, the congregation held services in both Hebrew and English. Louis Rothbaum, a Roumanian-born merchant, was its leader. The religious school had eight students, two teachers, and met once each week. Since only 18 Jews lived in Hartshorne at the time, B’nai Israel drew members from other towns in the area. The services in Hartshorne on Purim in 1916 attracted Jewish families from four other towns. Over these few years, the location of the communal gatherings switched back and forth between Hartshorne and Wilburton, a testament to the fact that while a combined community was sustainable, neither of these towns could have maintained a Jewish community of its own. The organization of B’nai Israel in Hartshorne in 1916 coincided with the development of Sunday school classes in Hartshorne, Wilburton, and nearby Haileyville. Rabbi Latz, working through the Correspondence Department of the Arkansas Conference of Jewish Religious Schools, organized separate schools in each of the three towns. The Correspondence Department was intended to gather “the children of scattered communities in Kansas and Oklahoma,” and provided them with copies of lessons and exams. In 1917, Hartshorne hosted its first confirmation ceremony at the local Masonic Lodge. That year, Hartshorne’s religious school, supervised by Leo Goldberg (the oldest of Mike Goldberg’s nine children), had 14 students and confirmed a class of six. Wilburton’s school had an enrollment of 13 across three classes, while McAlester had 16 students in three classes. Rabbi Latz continued to play an important role when he encouraged the formation of a chapter of the National Council of Jewish Women in 1923. The group formed with Fannie Gladstein as its first president, and within two years had compiled a cookbook of the women’s best recipes. The Hartshorne congregation dissolved by the beginning of the 1920s, though Jewish communal life didn’t stop during the decade as other Jewish organizations performed some of its functions. The community continued to have a confirmation class every few years. In June of 1926, the B’nai B’rith and McAlester NCJW hosted a confirmation service led by Dr. Samuel S. Kaplan, the rabbi of Temple Israel in Tulsa. Although no records suggest that a formal congregation or affiliation with a specific movement existed at the time, the service used the Union Hymnal and the Union Prayer Book, both publications of the Reform movement. Many of the students confirmed in that ceremony were the children of longtime residents and businessmen in the area, including children from the Elbert, Gladstein, Goldberg, Lapp, Rothbaum and Yourman families. ​Notably, the confirmation service opened with an English rendition of the Zionist anthem “Hatikvah.” In the 1920s, many Reform Jews and rabbis opposed Zionism, so the fact that the confirmation service included the song indicated the diverse nature of the community that gathered in McAlester. Like the singing of “Hatikvah,” the majority of the service was conducted in English, though the prayers before and after Torah reading, as well as those specific to Shavuot, were said in both languages. The Haftarah selection was read in English by Adeline Goldberg; though the first American bat mitzvah had taken place four years earlier, women reading Torah or Haftarah was not yet a common occurrence. 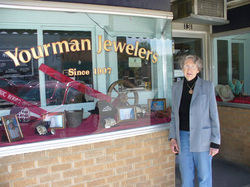 Ann Yourman in front of her family's jewelry store in Wilburton. Although the area’s Jewish population was scattered in various towns, they all played a similar economic role: owning retail stores. During the early 20th century, many more Jewish families had come to the area and opened businesses. By 1905 Herman Levin’s The Hub, Louis Berlowitz’s The Model, Nathan Levy’s clothing store, and Joseph Mazer’s jewelry store had joined The Globe and The Grand Leader in McAlester. A few years later, brothers Arthur, Irvin, and Jacob Krone opened Krone’s Department Store, which would remain a McAlester feature through the 1930s. The Baer, Elbert, Goldberg, and Lapp families all had stores in Wilburton when Ike Yourman came in 1907 to open a jewelry store. Yourman Jewelers would become the oldest business in Wilburton owned by the same family according to a feature in the Latimer County News Tribune in 1992. Ike’s children Howard and Ann joined him in the business, which finally closed with Ann’s retirement in 2004 after nearly a century of continuous operation. Benjamin Gladstein founded the Gladstein Company in McAlester in 1911. The dry goods business, which later expanded to a wholesale supply house, stayed open for 83 years. In 2012, a cornerstone with the Gladstein name was still visible on the building on South Main Street that the store occupied for decades. By 1920, there were at least 11 Jewish-owned businesses in McAlester alone, the majority of them clothing or department stores. That number remained consistent over the next decade, though some businesses closed while new ones opened. Though coal was the main industry in both Pittsburg and Latimer Counties in the first decades of the 20th century, coal’s decline in the 1920s seems to have had minimal effect on the Jewish population. In the early 1920s, after sending their eldest son to Fort Worth, Texas, to prepare for his bar mitzvah, John Joseph and his wife Anna moved their family to Wisconsin in search of a larger Jewish community. They left Leo Goldberg to manage their Wilburton store, and upon their return only a few years later, their son, Julian, became manager. In 1935, Leo’s brother Sam bought into the store, joining the two families in an official partnership and rebranding the store Goldberg & Joseph. Soon the families were bound by more than just economic interests: the next year Sam married John Joseph’s daughter, Sylvia. Sylvia and Sam managed the store for nearly four decades, retiring in 1974; the store closed four years later. The families also opened a branch in McAlester in 1929. Though it was owned by the partnership, Leo ran the McAlester store. In 1941 he bought the Josephs’ interests and renamed it Goldberg’s Department Store. The store closed in 1958 when Leo Goldberg retired. By the early 1930s, the Jews of the area began to discuss establishing a new institution to unify the community. Since the demise of the earlier Hartshorne congregation, Jewish children in the area had attended Sunday school classes in private homes in their respective towns. Finally, in 1934, Jews from eastern Oklahoma established the Jewish Community House in McAlester, which served Jews from Hartshorne and Wilburton as well. Benjamin Gladstein, Leo Goldberg, Alex Grossman, and John Joseph raised the money to purchase a building to serve as a home for the area’s Jewish community. ​The Community House was officially opened shortly before Rosh Hashanah. The founding officers of the Jewish Community House were all involved with family businesses in the area: John Joseph as president, Fannie Gladstein as vice president, Joe Weingarten as secretary, and Louise Grossman as treasurer. In addition to housing religious services and Sunday school classes, one of the primary functions of the Community House was to provide a space for the social gatherings of B’nai B’rith—which had 65 members in 1935—and the Council of Jewish Women. The two groups had monthly meetings, which they followed with a covered-dish dinner and games of poker and bridge. Multimedia: Harriet Carson grew up in Wilburton, Oklahoma. 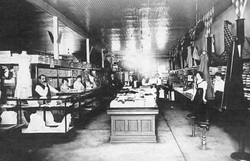 Her parents operated the Goldberg and Joseph Store, which had been founded by Harriet's maternal grandfather, John Joseph. Joseph's eventual partner, Leo Goldberg, was a brother of Harriet's father, Sam. In this clip she describes a small park that her family donated to the city of Wilburton in 2007. The Jewish community in the area thrived in its new center. By 1937, both Hartshorne and Wilburton had 12 Jews each, while McAlester had a Jewish population of 42. Only a decade later, the Jewish community that gathered in McAlester had more than doubled to 137. Through the 1950s the community usually brought in a student rabbi from Hebrew Union College in Cincinnati to lead High Holiday services. Harris Gladstein served a lay leader during the rest of the year. In years the Community House didn’t bring down a rabbi, they played a record of “Kol Nidre” at Yom Kippur services. Fourteen students were confirmed at the Aldridge Hotel in McAlester in 1937 in a celebration sponsored by B’nai B’rith and the McAlester NCJW. Students came from four towns in addition to Hartshorne, McAlester, and Wilburton. At the time, Benjamin Gladstein was president of the Community House and his wife Fannie served as president of the McAlester NCJW. By the 1950s, the community had gone into decline. The Jewish population of the towns dropped below 100 by 1955. In the early 1950s, Sam and Sylvia Goldberg had to drive their daughter Harriet to weekly confirmation classes in Tulsa since there were none locally. In 1955, however, their younger daughter Sally was confirmed in a class of one at a ceremony in McAlester officiated by Rabbi Robert Rosenthal of Tulsa. By 1956, the Gladstein Company and Goldberg’s Department Store were the sole Jewish-owned businesses in McAlester, though The Grand Leader still thrived in Hartshorne and Yourman Jewelers remained open in Wilburton. Around 1960, the Jewish Community House was renamed the United Jewish Center. Area Jews were very active in their communities. Many Jewish men were among the charter members of McAlester’s Rotary Club, founded in 1914; four served as president of the club. Alex Grossman, who moved to McAlester in 1910, served as the director of the National Bank of McAlester’s board from 1929 until his death in 1966. He was also president of the United Jewish Center, and in 1935 was on the state board of B’nai B’rith. Louis Berlowitz, proprietor of The Model clothing store, chaired the local Jewish Relief Campaign in 1918 that raised over $2300. Harris Gladstein served on the board of the local Chamber of Commerce. His son Irvin was a director of the National Bank of McAlester in addition to serving as the vice president of a local athletic association with ties to a minor-league affiliate of the New York Yankees. Leo Goldberg served as the president of the McAlester Retail Merchants Association and later became the first director emeritus of the Oklahoma Retail Merchants Association. Both Sam and Sylvia Goldberg were recognized as Citizen of the Year in Wilburton. Sam was a 40-year member of the Wilburton Lions Club, which dedicated a Sam Goldberg Scholarship in addition to naming a local blood bank in his honor after his death. Sylvia was a Tuberculosis Seal chairman for 35 years, and organized the first Mothers March for Infantile Paralysis. Today, the park functions as a gathering place and a venue for community events, and honors the Jews and other immigrants who helped to build Wilburton.